Children of the folk revival, Cathy Barton and Dave Para can credit older sisters with sparking their interest in folk music in the early 1960s, during what Martin Mull referred to as the Folk Scare. While echoes of those folksingers can still be traced in their music, the couple’s life in rural Missouri has focused their interest. A recognized master of the frailing banjo style, Cathy Barton has twice won the Tennessee Old-Time Banjo Championship, and Roy Acuff often called her his “favorite banjo player,” because her playing reminded him of earlier days of country music. Cathy can also be credited for some of the growing interest in the hammered dulcimer in the Midwest. In the mid-1970s, she was one of the first to play it at the Walnut Valley Festival in Winfield, Kan., providing a number of current players with their first hearing of the instrument. Dave Para took his sister-in-law’s guitar to classes at the Old Town School of Folk Music in his hometown of Chicago and rekindled his childhood interest in folk music. While attending college in Cathy’s hometown of Columbia, Mo., Dave lived at and helped manage the Chez Coffeehouse, a focal point of folk music in Central Missouri for 30 years. There he started accompanying several fiddlers, like master and champion Taylor McBaine, and began playing in local string bands like the Little Dixie Hoss-Hair Pullers, developing a distinctive back-up guitar style; and he met Cathy there, as well. 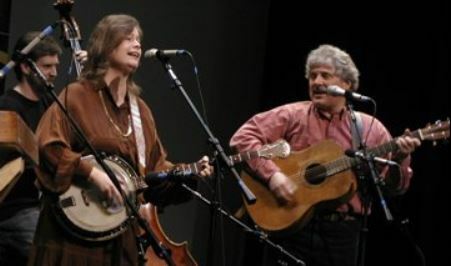 In their mission to introduce new audiences to folk music, Dave and Cathy participated in the artists-in-education program for the Missouri Arts Council since the early 1980s and work with Young Audiences, Inc., of Kansas City. They have done folk arts residencies and assembly programs in schools across the state. In addition to the Big Muddy Folk Festival, they produced a smaller festival in historic Arrow Rock, Mo., the Boone’s Lick Country Folk Festival for 20 years. Dave and Cathy continue to live in Boonville in a Greek-revival house that was built in 1859 by one of the town’s early photographers. Among other interests, Cathy continues her lifelong fascination and study of Native American culture, and Dave enjoys home brewing.